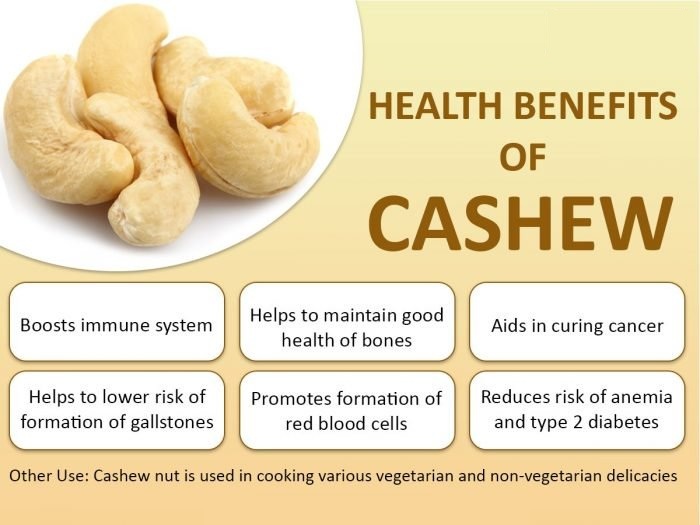 Cashew nuts are nutritionally much the same as other nuts: they are high in fat (around 50 percent), rich in vitamin E and a good source of minerals, particularly magnesium and zinc. While high in fat, all nuts are ranked highly for their healthy unsaturated fats. Cashew nuts differ by being higher in saturated fat – around 17 percent – than other nuts like almonds and walnuts, which are down at a low of 6 or 7 percent. It’s not a huge difference. This may be the reason you don’t see them listed as the best type to eat. Yet, if you had to choose between a fast food snack and a small handful of unsalted cashew nuts, I would go for the nuts every time. The salted roasted versions aren’t as healthy as ‘raw’ cashews but certainly are more crunchy and delicious to eat. In fac,t I should point out that ‘raw’ cashews aren’t really raw. 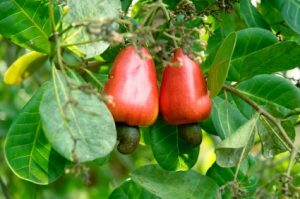 Cashews are actually seeds that grow at the base of cashew apples. In the shell of the cashew is an oil known as Cashew Nutshell Liquid (CNSL), which contains the highly irritant and toxic anacardic acid which can cause blisters, rashes and burning sensations. People who work in cashew facilities quite often end up with allergies because of the amount of CNSL they come into contact with in the course of their jobs. The cashew kernel comes in a very hard shell that cannot be cracked by hand so to soften the shell for removal, and to remove the irritant oil, cashews in their shells are boiled or steamed and then dried. They are then cracked one at a time (highly labour intensive) using a mechanical hand cracker to ensure the cashew kernel remains intact. Finally the testa or skin of the raw cashew is removed leaving the creamy white nut we are all familiar with. When dry or oil roasted, the cashew turns a golden yellow colour. It’s also possible to buy dry roasted cashews with the skin still on.